Carpet Dyeing and Carpet Cleaning in Boston - Products - DYE-RITE Carpet Systems of N.E. As you know, carpets are a major expense for homeowners, real estate management companies, hotel and motels alike. Making it last for as long as possible by renewing or changing color can be an important cost saving measure. Most carpets look like they need replacing after three to five years, often not because of wear, but for reasons of stained, faded or bleached out areas. Modern technology has proven it safe and economical to dye carpet back to life. The results are amazing! Your carpet will appear brighter, cleaner, and newer. When pet stains and bleach spots spoil the appearance of an otherwise good carpet, spot dyeing can be performed to match the lighter spot to the original carpet color. 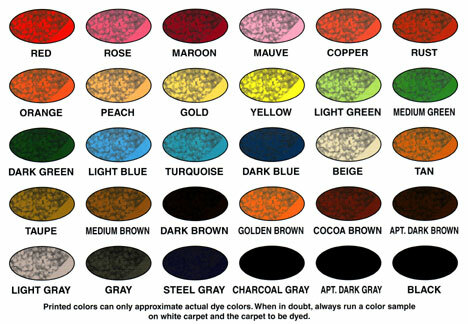 Spot dyeing can not be performed if the spots are darker than the original carpet color, as color can only be added to carpet and not removed. Our carpet cleaning procedure includes pre-treatment of heavily soiled areas, rotary scrubbing where necessary and cleaning by high-pressure truck mount to maximize cleaning results. All furniture is moved and replaced on carpet pads. If any stain can be lifted, DYE-RITE Carpet Systems of N. E. will get it out. Give your carpet another chance to appear Brighter, Cleaner, Newer !! The Color Magic, Do-It Yourself dye kit for only $29.95 can be purchased to dye carpet in automobiles, vans, RV's, boats or any carpet or area rug made of nylon or wool. The dye kit can also be used to spot dye unsightly bleached out spots. The supplies considered necessary are simple. A spray bottle or pump up sprayer, hot water, and rubber gloves and an eyedropper for spot dyeing. The Color Magic Dye Kit contains two 1-ounce packets of dye with detailed instructions to walk you through the process. These packets will dye approximately 20-25 square yards of carpet. See our FAQ (Frequently Asked Questions) for further information. On-Site Carpet Dyeing - Carpet Dyeing Kits - Commercial & Residential Carpet Cleaning. We are located in the Boston Area.